Today’s episode of Kasautii Zindagii Kay 2 starts with Komolika (Hina Khan) banging the dressing room and asking Prerna whether she is inside. 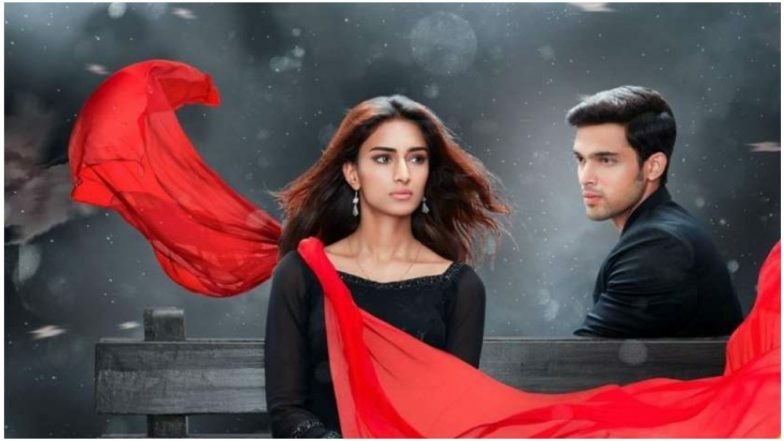 Prerna (Erica Fernandes) smiles at Anurag (Parth Samthaan) and tells if Komolika comes to know that if we are in the same room then what will she think and makes fun of Anurag. Prerna tells Komolika that they are stuck in the room and that she is not able to open the door, Komolika pushes the door and opens it. Prerna comes out and says that she was with Anurag in the room, Komolika goes and checks but could not find Anurag there. Just then from the opposite room Anurag comes and asks Komolika where was she as he was searching for him, Prerna asks how come you’re here as he was with her inside the room, Anurag says Prerna must be dreaming this all and that he was not with her. Anurag brings a saree and tells Komolika to try it for him, she goes in the dressing room. There Mohini asks Nivedita what is she doing and why is she letting Anupam come so close to her, Nivedita says that he is her husband and that she wants to give him a chance. Mohini says that Anupam is just behind her as he wants money and nothing else. Anupam overhears them and says that he will prove Nivedita that he loves her. Meanwhile, Prerna gets irritated as Anurag made a fool out of her in front of Komolika, Anurag tells Prerna that whatever happens she still loves him, Prerna goes from there angrily. Komolika comes wearing the dress, Anurag says she is looking wonderful. There outside the mall, some goons have come to loot the jewellery shop in the mall. Prerna and Shivani come inside one jewellery shop to buy a gold coin, just then the goons enter the shop and attack people. There as Anurag and Komolika go out of the mall, he hears a gunshot. Anurag remembers that Prerna had told she wanted to go to the jewellery shop and runs inside to save her. There the goons have got all the people on the gunpoint and tell the staff to put all the jewellery inside the bag. Shivani tries to call the police, but the goon stops her. Prerna fights with them and they run out, but Anurag comes in for searching Prerna, just then the goons point the gun towards Anurag. Prerna comes to save him, Shivani sees this and is happy as they care for each other so much. Komolika comes out of the mall but thinks she should go inside as Anurag might be in trouble and goes in. There Anurag asks Prerna that why she did not run away and came back of him, Prerna says that he also came back of her and asks why he came. Anurag is not able to say what he thinks about Prerna and tells her we should find a way to go out from here. Anurag tells that we should remove the rope first which the goons have tied in their hand, they take out the rope with the help of each other. There Komolika dashes with one of the goon and shouts at him, he sees Komolika’s ring and tells her to give it to him and drags her also inside the shop. Prerna gets a phone, she shoots the loot which is going on and uploads it and sends it viral and thinks someone will see it and call the police to save them. In the precap, Anurag is tensed as Komolika might think he loves Prerna and not her, there Shivani is telling Prerna that Anurag still loves her as she could see in his eyes. Komolika is telling Mishka that Anurag still loves Prerna and that this is not acceptable.